Today morning we heard historical breaking news that WhatsApp famous mobile app is acquired by Facebook in $19 Billion = 118200 Cr Rs/-. Till yesterday we were of the opinion that WhatsApp is very small company where only 55 employees are working and earning is limited 1$ per customer/user per year. WhatsApp is now valued $19 Billion, Believe me or not only 14 Indian listed companies are valued more than WhatsApp, even big company like SBI, Larsen & Toubro is valued less compare to single mobile application WhatsApp. As per me Facebook CEO Mark Zukarburg has hit the nail by purchasing Whatsapp as this is merger of two great innovations which will bring many new things. I have gather some fruitful information and I am herewith Success Mantras from WhatsApp CEO Jan Koum. I am sure these success mantras will help young and aspiring entrepreneur. Whatsapp is innovation and Innovation always creates value. If you want to create value and become successful you must opt for innovation. Innovation always works, some examples of innovation are Microsoft OS, Touch Screen Based Mobile, iPad etc. Jan Koum has started learning about computer and networking at the age of 18. He worked with Yahoo and at the age of 31 he left a job at Yahoo! with enough cash to launch his own business. Learning here is take experience, gain skill and make money required to start your own business. Jan Koum has failed many times in life even he was rejected by Facebook while applying for job. 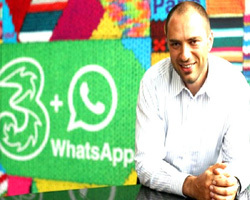 Jan Koum also faced multiple problems while making whatsapp app starting from coding to syncing and adding new features but he never give up and that is the reason he is successful. Jan Koum was born and raised in a small village outside of Kiev, Ukraine. He is the only child of a housewife and a construction manager who built hospitals and schools. His house had no hot water, and his parents rarely talked on the phone. If small middle class man Jan Koum can make this big why can’t we. Jan Koum another success mantra is to be simple & reliable. Whatsapp as app is so simple freely available & running the show without any advertisement. You just need mobile and yes it works on all mobile OS. Even on Desktop OS. Whatsapp persistent focus is on delivering a gimmickless, reliable, friction-free user experience. That is the reason WhatsApp is among the world’s most popular and profitable phone apps with 450 million user across globe. Did you enjoy like post, If yes do share it with your Friends on Facebook and Twitter! Even when I read the news , It came as a big surprise. But like they say , Innovation is not priceless , you just gotta know the right price.